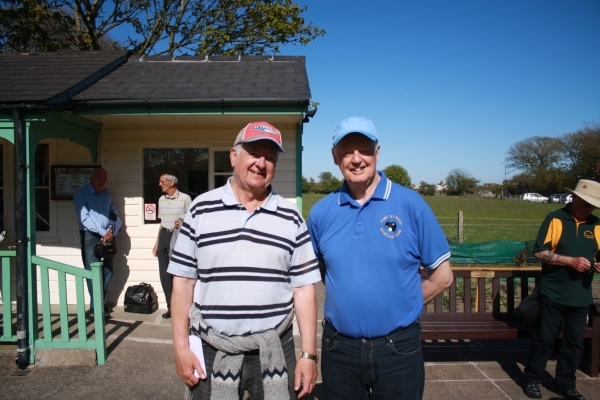 The Port St Mary Trophy, sponsored by Isle of Man Farmers Ltd, was played for on Port St Marys Bowling Green on Monday the 27th May and attracted a very good entry of 30 pairs. The weather at the beginning of the Competition was to say the least not very good, rain and a cool wind, but it improved as the afternoon wore on. The Green was as usual in excellent condition, thanks to the hard work put in by the Greenkeeper, Ray Watterson. The winners were the team of Trevor Quayle and Lyn Bolton who beat Arthur Moore and Jenny Maddrell 21 – 9 in the final. In the semi finals the team of Quayle and Bolton beat Ray and Ann Maddrell 21 – 13 and the team of Maddrell and Moore beat Paula Firth and Jordan Cain 21 – 17. Losing out in the quarter finals were the teams of Derek Allen & Caroline Whitehead, Alec Taylor & Phillipa Fletcher, Mathew Quirk & Jean Radcliffe and Zoe Bolton & Steve Moore. At the conclusion of the competition the prizes were presented by Mike Caley of Isle of Man Farmers Ltd. The weather did not look promising on Sunday 26 May when a field of 32 gathered to contest the Ladies’ singles open at Onchan. However the clouds cleared to give a glorious afternoon where the standard of bowling matched the occasion. There were some very close games, particularly in the quarter-finals where three of the four games were won to 19. Quarter-finals: Lilian Slinger 21, Chris Price 19; Shirley Whelan 21, Lil Smith 19; Theresia Britten 21, Rita Callister 13; Heather Horsburgh 21, Maureen Payne 19. Semi-finals: Lilian Slinger 21, Shirley Whelan 15; Heather Horsburgh 21, Theresia Britten 7. Heather got of to a flying start in the final, taking the first four ends to lead 13-6. In reply Lilian won 7 of the next 8 ends to go ahead 15-14.The players then won alternate ends to 19-18 in Lilian’s favour, before Heather took the final three to win 21-19 and get back the trophy she last won nine years ago ! The presentation was made by club Chairman Heather Reynolds who thanked everyone who had helped with the smooth running of the event. Stuart Garrett was a class apart as he won the revitalised Veterans Merit competition on Saturday at Port St Mary beating home greener Ron Maycox 21-14 in the final. Garrett asserted himself from the off in the final playing exceptionally well to build an unassailable 18-8 lead. Maycox who is a great competitor did not give in and dug deep to claw his way back into the game, however the bridge was far too big for him to build and he went down to a worthy victor. It is fantastic to see this competition running again after being cancelled in recent years due to lack of numbers, and with entry numbers being above the required minimum next year’s winner should qualify to travel to the UK to play in a national competition. With all the recent success of junior initiatives it is great to see the more senior side of our sport go from strength to strength. Garrett made the final thanks to a strong 21-11 victory over Douglas stable mate Ken Williams in the Semi-Finals with Maycox dispatching fellow Spaniard Ray Maddrell 21-12. Fallers in the quarterfinals were Mike Hargraves, Louis Callister, Ann Maddrell & Rita Callister. At the conclusion of the competition IOMCCGBA Vice President Phil Kerruish presented the prizes and thanks Port St Mary for the excellent condition of the green and all their support in running the competition and catering. 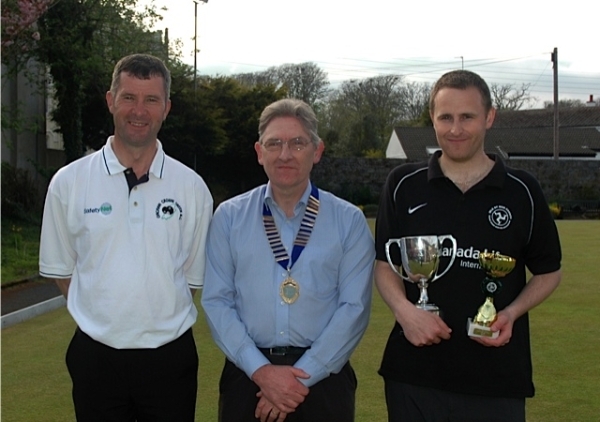 Glynn Hargraves picked up his second Canada Life International Manx Championship in as many years as he defeated Onchan team mate Kevin Quirk 21-16 at Castletown Bowling Green in a repeat of last year’s final to retain his title. Hargraves was in spectacular form all day playing with the experience and composure of a seasoned champion, and even on the rare occasions that he found himself in trouble he never seemed to lose focus or belief and just played his own game. Quirk himself a double champion, also played his part in making this a magnificent championship and put in some excellent performances on his way to the final. If anything though his success over the day is a testament to his resilience as despite not always being at his brilliant best he managed to grind out wins and almost pull off his third championship victory, falling at the last. In the final though, after initially falling a few points behind, Hargraves found his form and never allowed his opponent to fully settle, keeping him out of his devastating rhythm and in turn finding his own. Both finalists have been at the top of their games in recent seasons and you wouldn’t bet against either of them completing their hat-trick of titles next year. To reach the final both players had to dig deep in the semis as they both trailed moving into the closing stages of their encounters. Hargraves found himself 17-14 behind against former champion Phil Kerruish (Onhan) but had the wherewithal to see the game out finishing it off 21-18. Quirk as mentioned above showed the resilience of a great champion to overturn a similar deficit to beat Paul Skelly (Douglas) 21-19. Kerruish and Skelly both played magnificently all day and Kerruish’s crushing 21-11 quarterfinal victory over competition favourite and seven times Champion John Kennish was just one of the days many highlights. In the other quarter finals Skelly eliminated Chas Grills (South Ramsey) 21-6, Hargraves progressed with a good 21-13 win over perennial quarterfinalist Mike Cain (Marown) and Kevin Quirk just managed to see off the challenge of Neil Withers (Marown) 21-19. The whole weekend was one of personal achievement for Glynn who had the previous day coordinated and administered the sports inaugural inclusion in the Manx Youth Games, which was a massive success. Few people know this but just four years ago he seriously contemplated packing in the sport as he was becoming frustrated and disillusioned with it, and it was actually his success in this very same competition, just losing out in the final, which gave him the impetus to carry on and go from strength to strength. It would have been a total travesty for bowls if he had decided to quit and his decision to carry on has been invaluable for the development of the game due to his work off the green, which incidentally seems to have improved his form on it! At the conclusion of the competition Isle of Man County Crown Green Bowls President Steve Moore presented the prizes and thanked both Castletown Bowling club for their assistance in running the championship and Canada Life International for their continued support of the Islands premier completion. I would also like to thank new Association Competition Secretary Matthew Keggen who did a magnificent job of organising the competition at the first time of asking. And his continual work behind the scenes is dragging our sport kicking and screaming into the 21st century. At the end of the day however this weekend belongs to Hargraves and the only thing left to say is “well done mate, you deserve it”. Castletown A travelled to Isle of Man Bank Mens Division One Champions Onchan A last week and gave their all in an epic tussle near the top of the table. They left everything they had on the green, they came, they saw and they fell just short. Score lines rarely tell the full story and when you look back at the record books you will just see a 7-3 victory to Onchan, you will not see the drama that went into making this one of the most toughly contested encounters in recent memory. Like I always say there are 3 sides to every story, yours, theirs and the truth. The Castletown version will be one of heartache and hard luck and what could have been. With the last game on the green they trailed 4-3 with their man needing to win 21-19 or better to seal the points for his team and an historic 6-4 win for the visitors, and with the leg finally balanced at 16-16 anything looked possible. The victor’s story will be one of resilience, strength in depth and the emergence of a new hero. Despite leading 3-1 at the half way point they surrendered the lead to tie going into the last two blocks and an unthinkable defeat at their usually impenetrable fortress loomed on the horizon. With the seventh game sealed the weight of expectation rested firmly on the shoulders of the new kid on the block, Jordan Cain who in only his 5th league game for the champions showed composure beyond his years to bring home the tie for his team and more than justify his place in their stellar line up. The truth as always is somewhere in between and there are two major truths I have gleaned from this result. Town may not have left with a victory but they left Onchan Park with something more than that, they left hurt. This is because for the first time since their championship winning team of the 90’s they have genuine belief that they belong at the games top table, that they can beat anyone. This pain will help them as they will not want to feel it again going into tonight’s big clash against South Ramsey A. The Onchan story is far more frightening however as despite not firing on all cylinders yet they are still capable of dishing out that pain and any doubts on whether this year’s line-up has what it takes have been quashed, well for now at least. The other major contenders in the division had things more their own way. Leaders Marown continued to top the tree and pulled another point away from Onchan with an 8-2 home win over North Ramsey A. The only thing I would say is that although this is a good result, they were winning games like this 10-0 a few weeks ago so maybe there is a chink appearing in their armour? Douglas A leapfrogged town back into third place with a solid 8-2 win over Peel A at this Villa, whilst South Ramsey remain in fifth place, tied on points with Town, thanks to a 7-3 win over Nobles Mixed. Port Erin A have finally managed to reach the summit of division 2 after a crushing 10-0 defeat of Peel C. On this evidence I think they may pitch their tent and remain there for the remainder of the expedition. As I have said before they are a class outfit and will take some shifting in this tier. Castletown D remain on course for a shock promotion and they picked up another big win to find themselves in second spot, just one point adrift. Port St Mary B are now stringing some form together and in reality are likely to soon surpass Town D and move into a promotion place and their 7-3 win over Finch Hill B will do their chances no harm at all. The only other outfit I see with a realistic chance at promotion are Castletown C and their superb 9-1 win away at Port St Mary C keeps them in the hunt. There are a lot of teams in this division capable of taking points of each other and this championship race really could come down to the wire. Division 3 leaders Onchan C have settled nicely into their groove and a comfortable 8-2 win against Douglas C sees them four points clear of Nobles Park A in pole position. I was at the Villa Marina for that game and it was amazing to see a handful of new young bowlers on the display. The future of our sport certainly is in good hands. Nobles Park A won the derby against their B team to keep them in second spot and in line for promotion at the end of the season. 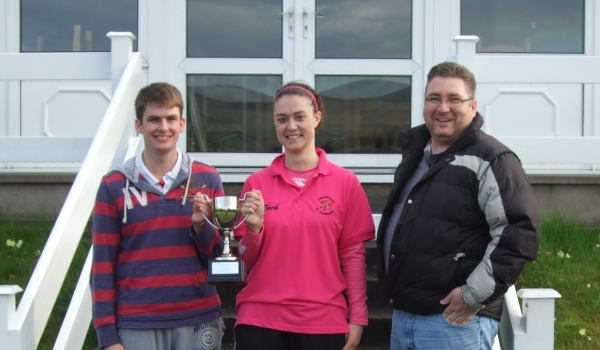 27 pairs took part in the Capital International Cup at Breagle Glen Port Erin. Once again the weather was normal for bowls , raining! Despite the green being wet there were some really good bowls being played and some close scores. The sun came out in time for the final and it was a very close game with mostly one’s being scored, firstly one side and then the other, eventually Matthew Keggen and Rachel Quirk were victorious 21-18 over Mary & John Alderson. Losing Quarter Finalists were Rita Callister & Thomas Keggen, Linda & Derek Cadamy, Hilary Kermode & Trevor Quayle, Caroline Whitehead & Ken Jackson. Losing Semi Finalists were Viv & Chas Grills, Trish Bull & Ray Watterson. Chairman, Di Benson thanked everyone for coming and Janet Shilling for running the days’ competition , then introduced Daren Ward from Capital International , sponsors of the competition , to present the prizes. 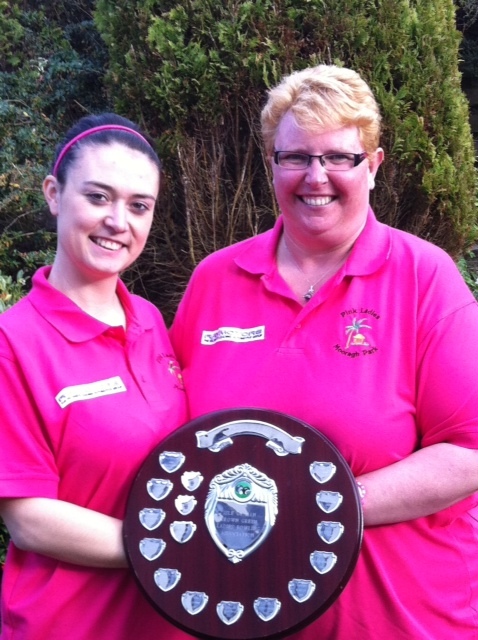 There was a strong entry of 28 pairs for the ladies’ doubles played at Marown on Saturday 11 May for the Greeba Cup. The weather was mixed, with sunshine, heavy showers and temperatures staying low. Despite the changing conditions the standard of bowling, particularly in the latter stages, was of a high standard. Semi-finals: Janet Monk and Lilian Slinger 21, Sonja Lees and Pat Robertson 13; Marie Ashurst and Kath Kinley 21, Helen Martin and Rachel Quirk 16. In the final Lilian and Janet took an early lead with a 3 on the second end but from 7-10 down the Castletown pair won 4 ends in a row to lead 14-10.Points were shared up to 15-16 when a 1 and a 3 from Marie and Kath took them to “all but”. Despite a 2 on the next end from the Mooragh Park pair the trophy went to Castletown 21-17. The presentation was made by Rosie Winckle who thanked all who had stayed to the end and everyone who had helped in the smooth running of the event. As I reviewed the results from last week’s double set of fixtures in Isle of Man Bank Men’s Division One, I sat perplexed, scratching my head to try and find what I should focus on for my report as nothing significant had really happened, but when I looked harder something had happened, normality had returned. After a yoyo start to their season Champions Onchan finally managed to get some momentum going stringing together back to back 9-1 wins over Port St Mary A & Nobles Mixed to move them within striking difference of leaders Marown, only 3 points adrift. Marown in turn also managed two much needed wins as they turned up the heat on the chasing pack. They started their week with a 9-1 win over Nobles Mixed before going to Castletown and slugging their way to a hard fought 6-4 win. Marown have what looks like a formality tonight as they entertain North Ramsey A at the memorial playing fields and they will look to give themselves more breathing space at the top of the tree with another strong home win. Town had begun the week well with an impressive 8-2 win away at Ballaugh A and this is the form they will hope to take with them tonight to Onchan Park to face the champions. Despite their midweek defeat they find themselves in a lofty third place four points ahead of Douglas A and will want to pick up some good away points to keep them there. Douglas had only one game last week and they picked up an impressive 8-2 win away at Castletown B. They face this seasons surprise package Peel A at the Villa Marina tonight and will hope they can amass enough points to leapfrog Town A back into the top 3. South Ramsey A also kicked into top gear with two wins in a week to find themselves on equal points with Douglas. South still have a most of the main contenders to square off again but even so they have to be happy with their start to the season. If any of the chasing pack want to seriously challenge for top spot this year they need to do two things they need to either beat or match the top two in head to head matches but more importantly they need to match or better their results against the other teams. This second point will be the key that could unlock the door to success it is not simply enough to win, they have to win big. If normality has returned to division one then insanity reigns in the second tier as Casteltown D find themselves in pole position after five games. They picked up a great 9-1 win on Tuesday against Port St Mary C before suffering their first defeat of the campaign at the Villa the following evening going down 7-3 to Douglas B. Surely this is the first time a D team has ever topped the second division? Port St Mary B & Port Erin A both picked up two wins each to close in on Town D and bring some sanity back to proceedings. Port St Mary B are the only undefeated team in the division and draw level with the leaders whilst Port Erin are only one point behind in a title race that could end in a photo finish come September. Onchan C top division 3 and even this early in the season they are the only team in any division who can boast a 100% record. A brilliant 8-2 win away at South Ramsey B is enough to see them two points clear at the summit ahead of Port Erin B who picked up a good 7-3 win away at Douglas C.
18 pairs gathered at South Ramsey on Saturday 4 May for the IOM Ladies’ Pairs. On a fast green and in a wind which got stronger as the afternoon progressed conditions were not easy. This did not prevent good bowling and some very close matches. Semi-finals : Jenny Maddrell and Ann Gale 21, Lyn Bolton and Paula Garrett 19; Helen Martin and Rachel Quirk 21, Linda Richman and Casey Bolton 9. In the final things were very even, and tactical, with one side taking a lead then the others catching up. Helen and Rachel surged ahead in the last few ends to take the title 21-16. The presentation was made by Association Competition Secretary, Elaine Moore, who thanked South Ramsey for allowing the Association the use of their green and facilities, and the ladies in the kitchen for providing the refreshments. Castletown played home to the Cain Cup on Saturday and most of the games major players were out in force. Kevin Quirk was in imperious form all day and whilst others struggled to get to grips with the green he mastered it with ease to pick up his first singles win of the season, beating current Island champion Glynn Hargraves 21-8 in the final. Castletown is the venue for the Manx Championship in 2 weeks’ time and if Quirk picks up from where he left off you wouldn’t bet against him winning his third title. The eventual winner was in control of the final from the off and never looked like falling at the final hurdle despite Hargraves’ best efforts to change things around. Quirk made it to the final thanks to a 21-14 win over home greener Andy Clark in the semi-finals. Hargraves played his best game in the semis just doing enough after surrendering a big lead to beat Colin Kelly 21-18. Fallers at the quarter final stage were Ken WIllams, John Kennish, David Bradford & Stuart Garrett.